Have you been thinking about becoming Catholic? Have you been thinking about becoming Catholic? Do you know someone who might be interested in becoming Catholic? The Rite of Christian Initiation of Adults or the RCIA is the process in which an adult becomes Catholic. The RCIA was given to the Church through a directive of Vatican II. It is the restoration of the method by which adults became Catholic Christians in the very early Church. RCIA is a journey of conversion – conversion of the heart and mind! The first part of RCIA is called “Inquiry” or the Pre-Catechumenate. We will begin our Inquiry sessions on Tuesday, May 1st at 7:00 pm in the Nazareth Center OR on Sunday, May 6th at 9:15 am in the Nazareth Center. To register or for more information, please contact Mary Ann Fox at mfox@annunciationorlando.org or Cathy Tardif at ctardif@annunciationorlando.org or call 407-869-9472. Pre-registration is not required. There are no fees for the RCIA process. A new session of Adult Confirmation classes will begin on Wednesday, May 2nd, at 7:00 pm in the St. Gabriel Life Center. We will meet for six consecutive Wednesday evenings, from 7pm to 9pm. 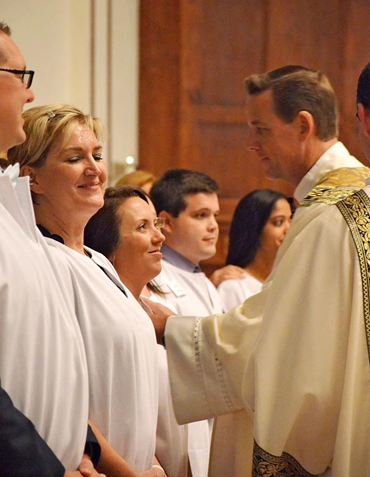 The Confirmation will take place on Friday, June 8th at 7:00 pm, at St. James Cathedral in Orlando with Bishop Noonan. These classes are for those over 18, who have already received the Sacraments of Baptism and First Eucharist in the Catholic Church. For more information or to register, please contact Mary Ann Fox at mfox@annunciationorlando.org or call 407-869-9472.